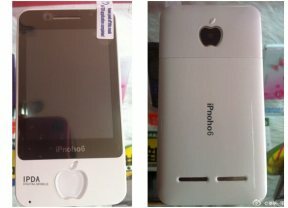 Meet the future, everyone: The iPnoho6. Steve Jobs would be proud. This Shanzhai special isn’t even an iPhone clone. It doesn’t deserve that honored distinction. This is an IPDA as it’s labeled on the front under the small screen and next to the large Apple logo. Around back are two large speakers and yet another Apple logo — because, you know, two Apple logos equates to twice as much fun. The only thing that’s missing from this IPDA is an iStylis. Pricing and international available is unknown. Don’t count on a quad-core CPU, LTE or NFC, though. This feature phone probably just barely functions. But of course, if it doesn’t, you could always trade up to the iPncne 7.